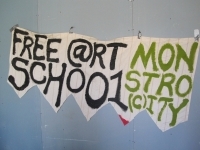 For the first weekend of Launching Pad, GALERIE8 has invited the Missionaries to Free @rt Sch001 (F@S) who have chosen...MONSTRO(C)ITY as a jumping off point for both play and politics. 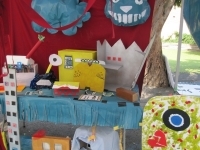 From Saturday morning to Sunday evening, a full weekend of un-schooling through creative writing, storytelling, puppetry and monster-making will culminate in a discussion on the monsterous state of education. 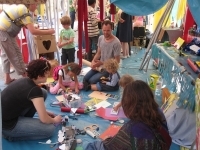 Participants, self-organizer-types, critics, lovers, catalysts, fakers, Shakers, people who pretend to be adults and artists of all sorts are invited to take part in actions of play as a way of exploring, un-catagorising and freeing so-called modes of artistic production. The F@S work to highlight the joy of learning and making artwork, and hopefully inspire others to do the same. The Missionaries to F@S will lead a Monstro(c)ity workshop. Children of all ages are invited to GALERIE8 to fully immerse themselves in a monster city. Costumes, cameras, candy, and creative collaborations are only the start. 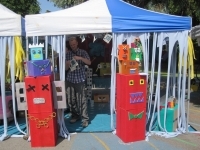 Come and bring your mini-monster for some midday madness at the Broadway Market in London Fields. Microgranting Meal and performance reading by Flee Immediately! Tying in with the weekends monster theme is a fundraising initiative called ‘Sweet Savage Stew’, where artists’ proposals are the content for the evening. Participants are invited to attend, submit a proposal in need of funding, and join us for dinner for a suggested £5 donation. Attendees are also encouraged to contribute a vote in the grant-giving process, and good conversation on sustainability in the arts. One proposal submission will have a small project funded at the end of the evening. The idea of a ‘soup grant’ was conceived in Chicago by InCUBATE (Institute for Community Understanding between Art and the Everyday) and has since become a popular form of art funding. Included as part of the evening, is a very special performance reading by Renee Carmichael of Flee Immediately! interactive media journal, entitled “In’s and Around’s of Processed Soup”. DISPATCHES FROM THE RUINS | a downloadable publication prepared by F@S Missionaries, 1000 Little Hammers, which addresses the monstrous state of higher ed.